So reads Sir Christopher Wren’s epitaph in the crypt of Saint Paul’s Cathedral in London. Two years of high school Latin hardly equip me, now so many years later, to offer anything but a clumsy translation, so I’ll give you what anyone can find on the internet: ”If you would seek my monument, look around you.” If you’ve been to St Paul’s, you’ll understand. While I have Wren’s greatest accomplishment in mind, let me go way out on a limb and volunteer an opinion: having been in both Saint Peter’s in Rome and Saint Paul’s, I’ll take London any day. The nave of St Peter’s does absolutely nothing for me; IMHO, it my be the world’s largest marble-clad barn. Wren, on the other hand, has achieved the conjoining of opposites: intimate grandeur. Perhaps it is simply the contrast with Rome (not me favorite place) but Wren’s church gives me the warm fuzzies; makes me feel noble, consoled. Everywhere I turn, there is warmth and a sense of scale intended to comfort. I sometimes wonder if Bramante’s original scheme might have been more Wren-like. Since my last visit, a new memorial has been placed in the nave floor, the equal of Wren’s understatement, for here is buried another scientist, someone Wren would have understood: Stephen Hawking. I hadn’t intended to say anything at all about Wren or St Paul’s; certainly nothing about St Peter’s, but I seem to have tombstones on my mind: one that I’m designing for my father and another that occurred to me just this afternoon. A far humbler but equally noble building is the former Episcopal church in Casselton, St Stephen’s, constructed in 1885-1887 and a memorial in its own way to the contributions of three men who are mentioned nowhere in the building itself: its architect George Hancock, and his collaborators Rev B. F. Cooley and Scottish stonemason Nathaniel Maconachie. And with regard to all three, if ye seek their monument, look about you. The tale of their work together is one I love to share, but this evening it is Maconachie on my mind. Nathaniel Maconachie is a fellow Scot, born near Loch Ness and trained in stonework at Aberdeen. He shows up in the Scottish census at one year old and twenty years later. But he is strategically missing in the 1861 census, when he was eleven. That would be just about the right age for a young boy to be articled out for apprenticeship, so he warrants a little more sleuthing on that score. From Scotland, Maconachie—it’s pronounced ma–KAHN–shee, if you’d like to be authentic—spent three years in South Africa building a railway line to the gold and diamond mines of the interior. Then he returned to Scotland before the voyage to America, an 1885 sailing that took him to Philadelphia and then almost directly to Fargo, Dakota Territory. Any readers here who attended NDSU will ahve seen his work on Old Main. But his more interesting work was done with architect Hancock and Fr Cooley: a series of small split-fieldstone churches for Episcopal congregations all over eastern North Dakota (which technically didn’t exist yet). His obituary claims nine of them but only two are identified: two in Minnesota (Wadena and Perham), two unnamed in Montana (but probably Bozeman and Anaconda), and the remainder scattered in eastern Dakota (Casselton, certainly, but the others would be a guess. By 1900 Nathaniel and his wife Margaret had retired to a farm in Corliss Township, northeast of Perham. She died in 1911 but Nate lived on until 1929, and both are buried in the Perham Cemetery. I learned today, however, that their graves are unmarked and it seems especially sad that the stonemason’s art is absent from a stonemason’s grave. Why do I feel the need to fix that, do you suppose. This example of the stonecarver’s art, incidentally, is the work of Tracy Mahaffey of Greene, Rhode Island. Would that I could afford her craft for the Maconachies. 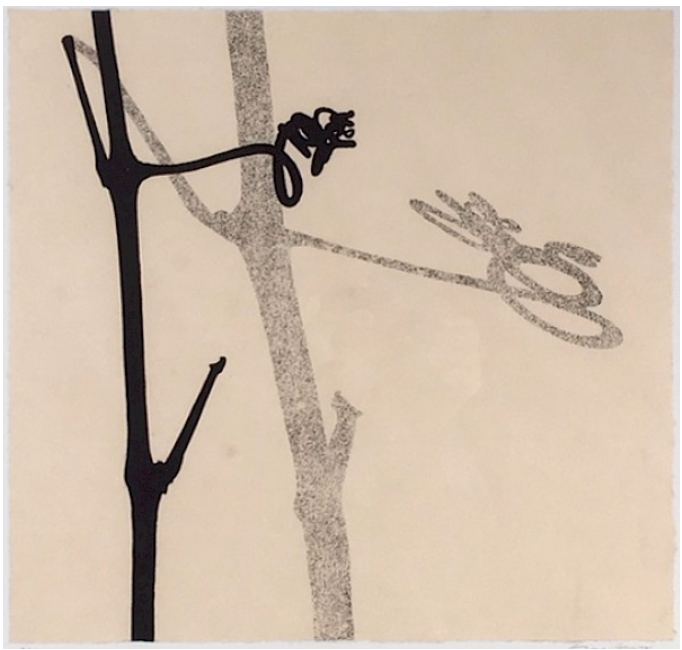 Bainbridge Island resident Gary Groves’ series of woodcut prints titled “Entangled” are intimate studies of nature found in the Pacific Northwest. Removed from their context and seen at close range, they become abstract gestures, arabesques, the graceful curves of Japanese calligraphy. They are also akin to the insights of other artists working a wildly different media. 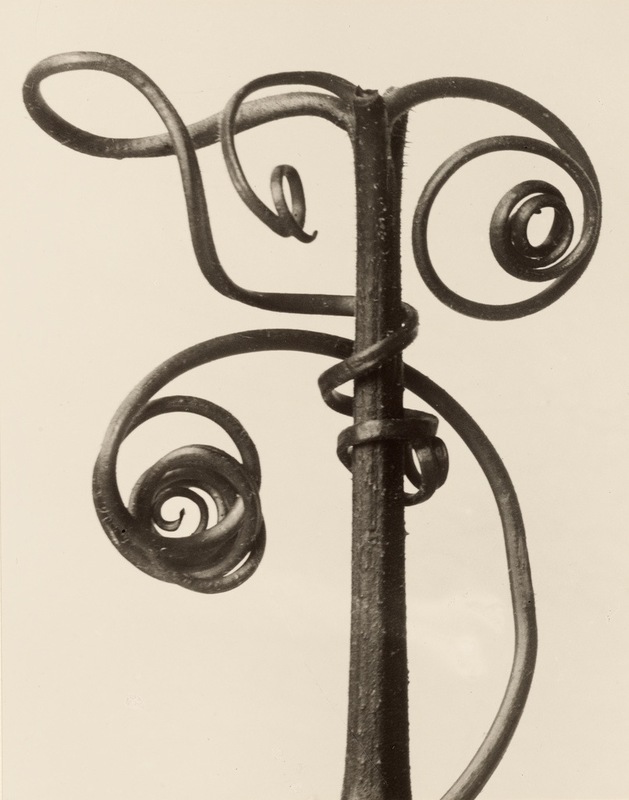 Almost a century earlier German photographer Karl Blossfeldt was also fascinated by plant forms; “urformen” or archetypes, he called them, and published a collection in 1929 as Urformen der Kunst. Likewise Blossfeldt’s images bear uncanny resemblance to the cast iron and terra cotta ornamental forms of Chicago architect Louis Sullivan, working in the late 1880s and early ’90s. Blossfeldt might have said the same of Groves’ woodcuts. Short of buying property in London itself—I don’t recommend even looking—the region in Gloucestershire known as The Cotswolds might run a close second in property values. We’ve spoken of emigration to the U.K. (while it’s still “United”) but the land of the Scot is about what we can afford, and then some miles from the amenities of shops and a decent latté. I spent two weeks on Skye some years ago and learned the limits of charm and the country life. And I was considerably younger then, so the two-mile trek to the Ardvasar Lodge was fun and even the two-mile walk home by moonlight in a single-malt haze wasn’t all that bad. 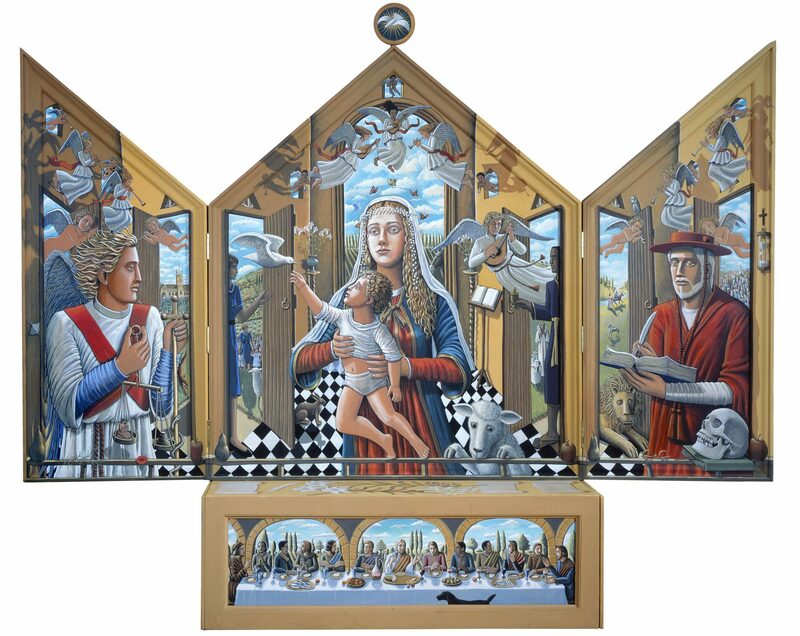 So when the latest TLS arrived with this triptych on the cover, and when the photo credit informed me it had recently been installed in the church of St Michael & All Angels in Bishop’s Cleeve, Gloucestershire, I had to learn more. 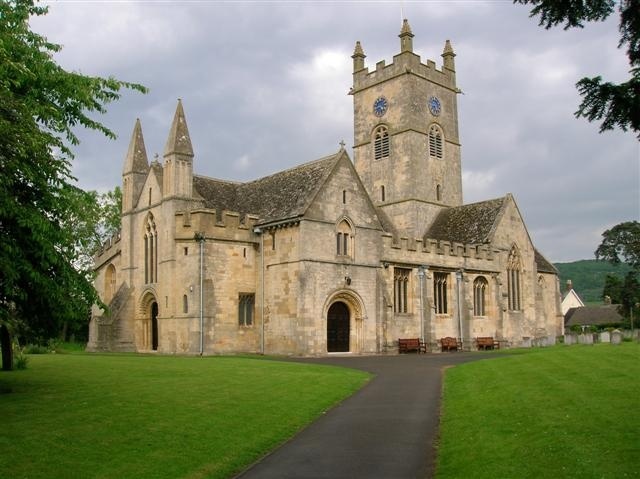 Bishop’s Cleeve—think St Mary Mead Times three—is a village in Gloucestershire a few miles from Cheltenham. Rent a car, because the trains quit running there some years ago, even prior to privatization of British Rail, but it will be worth the trouble and time to see the 12th century church and its new altarpiece. The church was dedicated in 1066 but the style is Early English. I’m certain the church has elements from the entire mediæval period; that’s just the pace of building off the grid. In fact P J [Pamela June] Crook’s contribution attests to the never-finished-ness that architecture can sometimes exhibit. 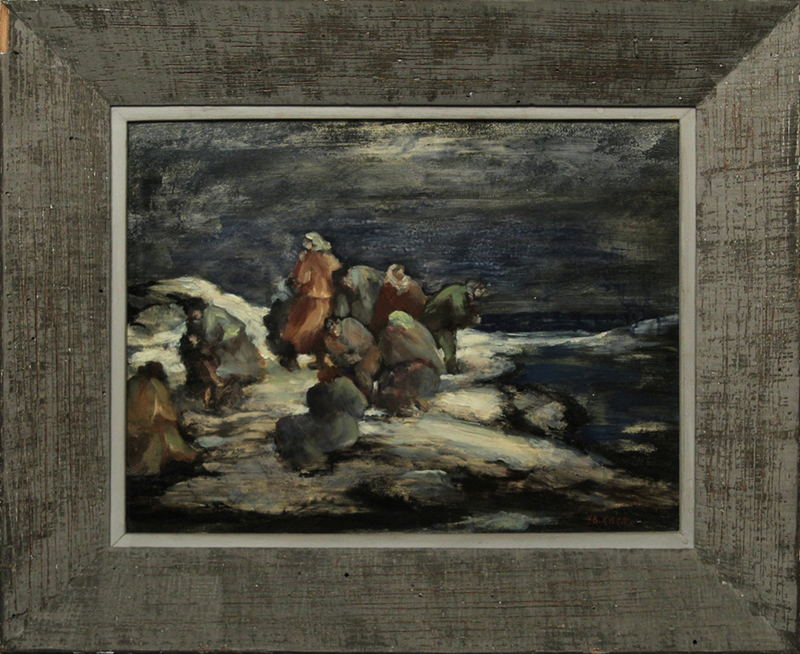 Crook’s painting resonated with me because the current Agincourt exhibit includes a triptych by Philip Thompson, a 1967 work I bought from his garage sale more than thirty-five years ago. Looking around for artifacts to interpret the evolution of St Joseph the Carpenter in Agincourt, I was an idiot not to have noticed Thompson’s painting on our dining room wall. It was the perfect balance of color, size, and style, and especially “Lutheran” for Episcopalians. Then came the long-standing need for a baptismal font—a story almost as old as the project itself. Strapped for cash early in its history and lacking a well-healed donor, the church had used a common green enamel kitchen basin for Christening until something better could be got. That came shortly after the 1898 remodeling by Proudfoot & Bird, when a beautiful embossed copper bowl was acquired from The Roycrofters (of Arts & Crafts fame) in 1910. As we approached the 2015 exhibit and I hoped to incorporate more craft in our offerings, I searched for an artisan who works in copper but failed miserably. Oh, I found people; they just laughed at me. OK, so copper wouldn’t be our medium. What about wood? Workers in wood were even rarer. So I modified the story line and changed medium again. Now the basin could me the contemporary replacement for the Roycrofter piece, stolen on the eve of the church’s 150th birthday. And the replacement would be ceramic, crafted (we hoped) by Richard Gruchalla and Carrin Rosetti. That, indeed, came to pass on the afternoon of the exhibit’s opening, and the group of two paintings of St Joe’s, the Thompson triptych, and the new baptismal basin were an ideal ensemble. Not quite the same as Bishop’s Cleeve, but perfect for our time and place. 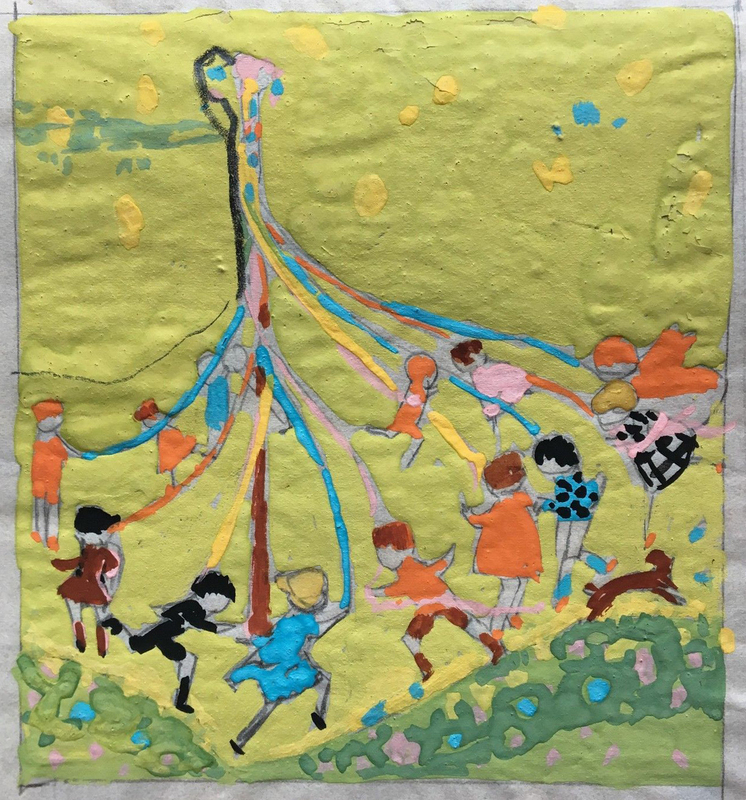 It may seem at times that the Community Collection is heavily weighted toward the Arts & Crafts imagery of the World War I years into the 1920s. Depending on the current display selection, that may appear to be the case. Newcomers to the community, however, may not be aware of the Arts & Crafts Society that thrived during that time, especially after the disappearance of Anson Tennant in 1915, when his parents established a center for arts and crafts in his former architectural studio-residence, a place for lectures, classes, and exhibits, and guest quarters for visiting artisans. So the presence of so many woodcut prints, for example, is understandable. Leslie Ward was a British artist known for both woodcuts and paintings. This minuscule watercolor was painted by another Chicago artist, Margaret Iannelli. She is regrettably far less well known than her husband, Alfonso, who collaborated with Wright on important projects like the Midway Gardens project of 1914. Just as regrettably, Prohibition put the Gardens out of business and it was demolished in 1929. As with many collaborations it is difficult to identify the contributions of Margaret and Alfonso. 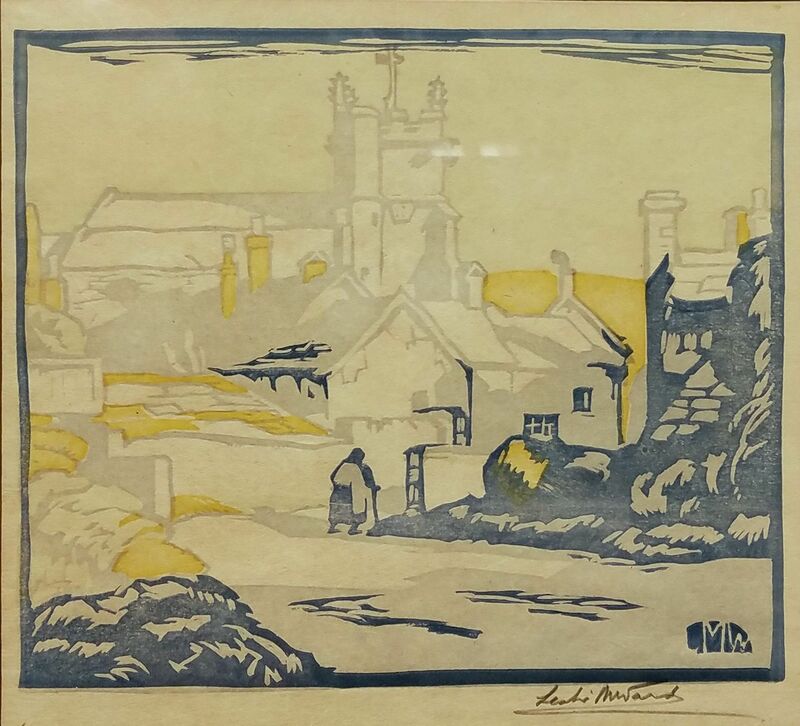 In this case, however, the drawing is hers, one of many she did for advertising and book illustration. We are fortunate indeed to have such an ephemeral piece from an important American artistic period. the 1920s were the Golden Age of poster art. 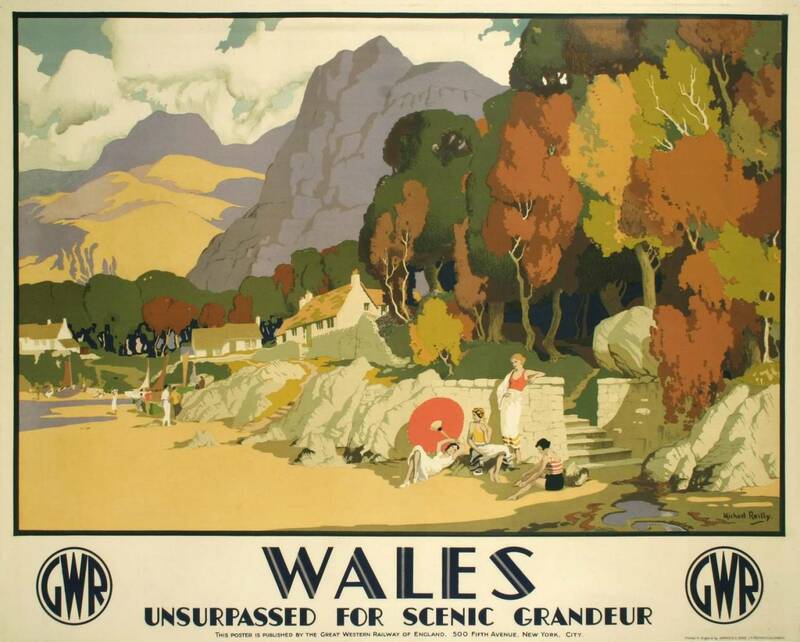 Whether this travel poster, enticing the British rail traveler to consider a holiday in Wales — a spectacular example of the art of Michael Reilly — or Alfonso Iannelli’s circus promotion, graphic design became a highly respected form of expression. [If the Iannelli has some familiar elements, it’s because he worked with Frank Lloyd Wright on projects like the Midway Gardens. The dog balancing a ball on its head has qualities similar to the “Water Sprites” at the Midway Gardens.] I certainly have an affinity for both styles, though it was the Great Western Railway’s advertising campaign that first came to mind. Oh, and if you’re curious, theses two artists were born in 1898 and 1888, respectively. I had hoped to incorporate a few “vintage” Agincourt posters in the current exhibit — the exhibit will possibly up through New Year’s — but that, like several other components remain in my mind’s eye. Imagine, for example one of two campaigns by the Northwest Iowa Traction Co., promoting ridership on the line, which ran from Fort Dodge to Storm Lake, with the intent to push on the Sioux City and/or Omaha. The first in the 20s, while times were good, suggesting seasonal travel to Sturm & Drang; these might reflect “lake life” in general or one of the resorts, like Smith’s Hotel, in particular. Other NITC-connected travel destinations might include the Fennimore County Fair or the home games of The Archers, our Double-A baseball team. Then there were the 30s, the Great Depression, and the cheap travel afforded by the NITC. Similar motivation probably underwrote conditions during the war years: free travel to the community’s “Victory Gardens” on weekends, for example, or free travel for military personnel. We don’t have dramatic landscape to promote. 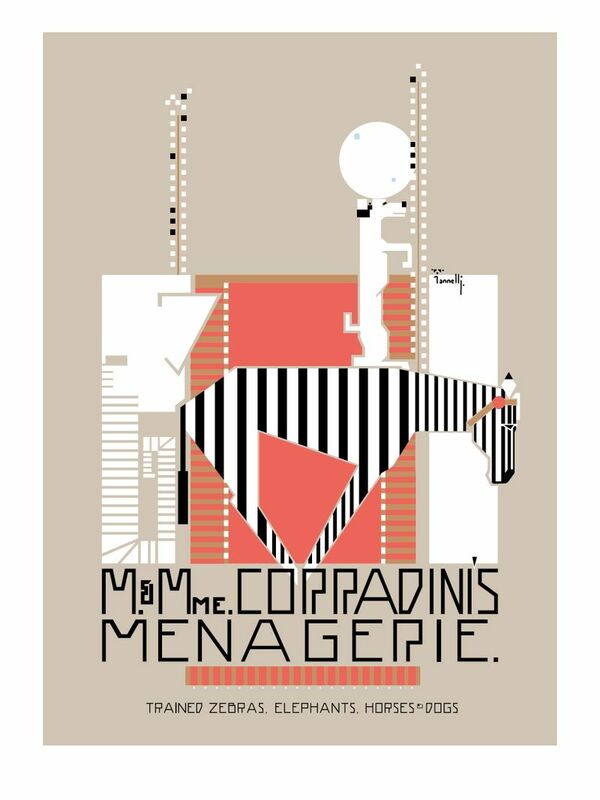 Nor is Corradini’s Menagerie likely to have passed through town. Still, I can dream. Hilde Kayn is a case study in why the internet shouldn’t be the only source. Hilde Kayne’s on-line biographies are remarkably short and repetitive; and their tidbits of information seem to have been routinely cut and pasted from one page to the next. Her dates, for example, are most often given as 1903-1950, and there is nothing particularly earth-shattering about her death at age forty-seven. But on further investigation, the 1903 birth year doesn’t hold up. Other genealogical sources almost consistently suggest a birth year closer to 1894-1895. A 1935 passenger list for her arrival at the Port of New York gives her age as forty. Another, from ten years previous, gives her age as thirty. Her petition for naturalization offers a birthdate of 19 September 1894. The smoking gun for “1903” appears to be the Biography & Genealogy Master Index (BGMI), and until that can be consulted, their source remains a mystery. Saying more about this enigmatic artist is difficult because, by some accounts, she was shy, refusing even to do gallery talks as part of her many exhibits.